Team Wales: Halfpenny (Scarlets); Adams (Worcester), S Williams (Scarlets), Parkes (Scarlets), S Evans (Scarlets); Patchell (Scarlets), G Davies (Scarlets); R Evans (Scarlets), Owens (Scarlets), Lee (Scarlets), Hill (Dragons), AW Jones (Ospreys capt), Shingler (Scarlets), Navidi (Cardiff Blues), Moriarty (Gloucester). Replacements: Dee (Dragons), W Jones (Scarlets), Francis (Exeter Chiefs), B Davies (Ospreys), Tipuric (Ospreys), A Davies (Scarlets), Anscombe (Cardiff Blues), North (Northampton). Last edited by Dai another day on Sat Feb 10, 2018 2:19 pm, edited 2 times in total. Wales team: Halfpenny (Scarlets); Adams (Worcester), S Williams (Scarlets), Parkes (Scarlets), S Evans (Scarlets); Patchell (Scarlets), G Davies (Scarlets); R Evans (Scarlets), Owens (Scarlets), Lee (Scarlets), Hill (Dragons), AW Jones (Ospreys capt), Shingler (Scarlets), Navidi (Cardiff Blues), Moriarty (Gloucester). Saes by 10 at the very least. 10 Llanelli Scarlets starting, 2 more on the bench. Impressive contribution. Game of the weekend ...to be fair. Grand Slam champions elect by twenty. Three sizzling Halfpenny tries from halfway (converted, natch), and a Patchell drop-kick after 50 effortless phases of play. Against a solitary, controversial penalty from Owen Farrell, in the dying seconds. So strong that they can afford to leave out Liam Williams altogether and have North on the bench. While we have to call up a 34 yr old s/h reject. I ripped all the skin off my knuckles punching the ceiling of the pub. But had watched minutes 1-75 through my fingers. All that clip from last year shows me is how incredible it was that wales won any games in the last few years with Alex Cuthbert defending his wing with all the positioning of a blind rabbi carrying a rainbow flag at a Neo Nazi rally. Exactly. We said he’d cost us the match - and he did. It also reminds me how small the margins are in the 6n. People like to joke that we were right down the table last year and thus shite, but other than an embarrassing non show in Scotland, we were within whiskers of winning the championship. A Fluffbert fluff in the dieing mins and a French cheat at 80mins. When is the English team announced? What changes apart from scrum half are we to expect? Thank God Cuthbert is not in the match day squad. You will find another escape goat should Wales lose. I'd imagine England will come out Thursday. My bets are Wiggy and Nowell to start, May to the bench. Someone may have a defensive lapse, but it won't be as woefully predictable as that one. And yes, Daly very good player, but I'm more grateful that Billy isn't there to be honest. In all fairness Wales could feel somewhat relaxed going into the game compared to England no? England will certainly be heavily favoured to win at home and if it's tight at the death they'll probably be sweating it more. Wales can certainly be confident on the back on a convincing win first up. How big a blow do you English think the Youngs injury is? Care has been pretty good this season for Quins from what I've seen. TBH before last year's match I said Cuthbert would be targeted and cost us the match and I was right. The progress of England in the last year or so has been amazing. Their talent scouts have done a great job and their coach has harnessed their vast resources perfectly. All credit to Eddie and his team. Let's hope rugby is the real winner on Saturday and we have a great game. I've just watched it about 8 times on the trot on YouTube. You just knew he would never make that tackle. I'm getting a bit of déjà vu here. The 2008 fixture was Gatland's first in charge of Wales and he picked a mostly Osprey's side if memory serves. Going with a backbone of Scarlets he's going to hope for that regional understanding and confidence to cause England substantial problems. They're a side without any clear weaknesses and I think England will need to man-up to come out ahead in this one. I'd wager it's going to be a high scoring game but too close to call. I think we have defensive frailties that will be exploited. Your level of experience and nous will be too much for our inexperienced backs. I can't see Patchell playing as well as he did last week again. You can expect England to hurt us more in the tight exchanges, drag people in, and make more space out wide - then the 13 channel becomes more exposed. The scots couldn't isolate Scott Williams, which is what I feared pre-match. If England play Joseph then his pace might be telling in that area - I think I would rather see Te'o, than him. Te'o is good but a more straightforward physical challenge which I think Scott Williams can cope with. My reservations are that this is a good England team, and being at home, and in form, our pack has to be better than last week - they handled brilliantly, which I hope we see more of, but they'll need to do a lot more tackling than the scots made them do, and we'll need the likes of Owens, Moriarty and Navidi to offer more carrying threat. Huge test of different parts of our game from last weekend. However 2008 parallels - Wigglesworth (potentially) on the bench again, and if Lawes plays 6 then they'll be playing a lock in the backrow, as they were for much of that game. You really think we're unaware of that? JD got plenty of stick for that unusual error - Cuthbert got more stick for being out of position defensively for the millionth time. Can you understand the difference? England can also be caught out defensively in the wide channels. Wales defended well against the Scots and never looked in trouble -albeit, the Scots did give the ball up easily and their line out was a shambles. Both sides should present bigger challenges, all over the park, than last week’s opponents. Both sides will have to work very hard up front to get some impetus for their backs to capitalise on. The packs look fairly well matched - Wales may get a slight edge in the scrums if our front row isn’t careful. This is such a big test for the Welsh team. England must be massive favourites for this and I think they're going to play a superb game. 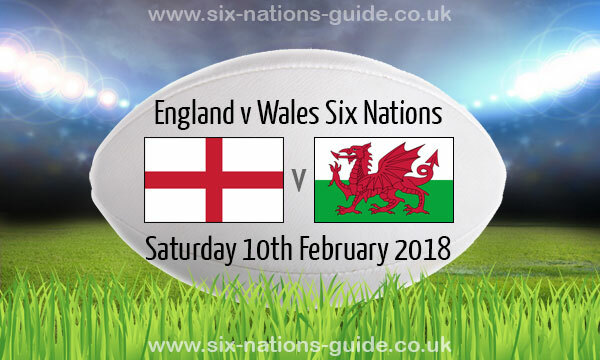 I have no idea how Wales are going to handle it, it's going to fail at some point and England are going to score some tries hopefully Wales can stop them from doing it early and can work up a try or two themselves.